Starting Saturday, concealed guns will be permitted at college campuses in Georgia and Kansas, more public buildings and bus stations in Tennessee, and at the Iowa state Capitol as new laws take effect continuing the steady expansion of gun rights in Republican-controlled states. The firearms policies are among scores of laws scheduled to take effect Saturday, along with the start of the new fiscal year in many states. Some of those laws continue a recent trend of states taking the initiative to fix aging roads and address the drug overdose epidemic. The gun laws reflect divided public preferences, highlighted by a recent Pew survey that found people nearly evenly split on whether gun control or gun rights were more important. A voter-approved gun-control initiative prohibiting people from possessing ammunition magazines capable of holding more than 10 bullets was to go into effect Saturday in California. But it was blocked this week by a federal judge, who said it would have made criminals out of thousands of otherwise law-abiding citizens who own the magazines. A similar law passed by the Democratic-dominated Legislature also is subject to the preliminary injunction. For decades, the National Rifle Association pushed for state laws allowing people to carry concealed guns with permits. Having succeeded nationwide, gun-rights advocates now are gradually expanding where those weapons can be taken. Yet even some of the new laws contain exceptions. Georgia’s law will allow people with concealed handgun permits to take their weapons into classrooms but not dormitories, and college sports fans will be able to pack weapons while tailgating but not inside stadiums. A Tennessee law allowing guns in many local public buildings, bus stations and parks can be voided if authorities instead opt to install metal detectors staffed by security guards. Concealed guns will be allowed at college campuses in Kansas as a result of a 2013 law that applies to public buildings lacking heightened security such as metal detectors and guards. A four-year exemption for universities expires Saturday. But in a setback for the NRA, a law that Republican Gov. Sam Brownback is allowing to take effect without his signature will make permanent a similar exemption for public hospitals and mental health centers. 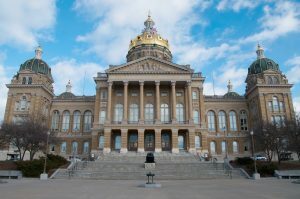 In Iowa, where permit holders will be able to carry concealed guns in the Capitol, the state Supreme Court has responded by banning weapons in all courthouses statewide. But advocates for greater gun regulations also are pleased with the results. On Thursday, Democratic-led Hawaii became the third state to enact a law requiring notification to law enforcement when people prohibited from owning guns try to obtain them anyway.